Glen Johnson knocked out American Roy Jones Jr in the ninth round to retain the International Boxing Federation light heavyweight title in Memphis. The Jamaican-born fighter was leading on all three judges' cards when he floored Jones with a right cross. Johnson improved to 41-9-2, with 28 KOs, while Jones suffered the third defeat of his career against 49 wins. The American, who lost his WBC crown to Antonio Tarver in May, may now elect to end his brilliant career. Jones has captured titles in four weight divisions and was widely touted as the best pound-for-pound fighter in the world until this year. 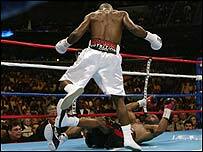 But after seeing his charge take15 minutes to leave the ring after being knocked out, trainer Alton Merkerson admitted Jones could face retirement. "That's something he and I will have to talk about," Merkerson said. "He's getting hit now more than he used to." Johnson, who won the vacant title in February with a victory over Clinton Woods, said his aim was to stay close enough to Jones to give himself a chance. "I decided I wasn't going to let him jump in," said Johnson. "My game plan was to come in and beat him - if it comes to a decision, make sure you did enough work each round to get the decision." On the undercard, Ivan "Choko" Hernandez bt Mark Johnson by eighth-round KO to win his WBO super flyweight.